Wet. Meadows, woods, marshes, stream banks. Full or partial sun. This is a 8″ to 24″ tall, erect, perennial forb that rises from a thick caudex with fibrous roots. It occasionally forms colonies. 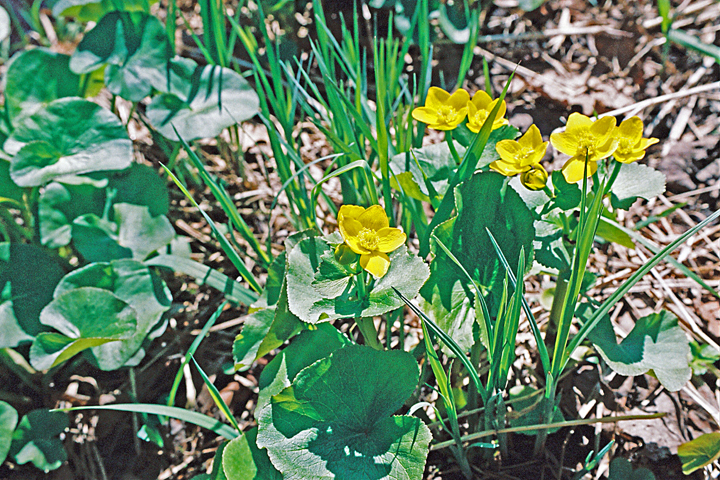 The stems are erect, hairless, leafy, hollow, and branched toward the top. They sometimes sprawl with age, producing roots and new stems at the nodes. Basal leaves are ¾″ to 5″ long, ¾″ to 7½″ wide, round, rounded heart-shaped, or kidney-shaped, usually with a deep, narrow sinus. They are on leaf stalks that are up to 6″ long. The margins have small, shallow, rounded teeth. The upper and lower surfaces are hairless. 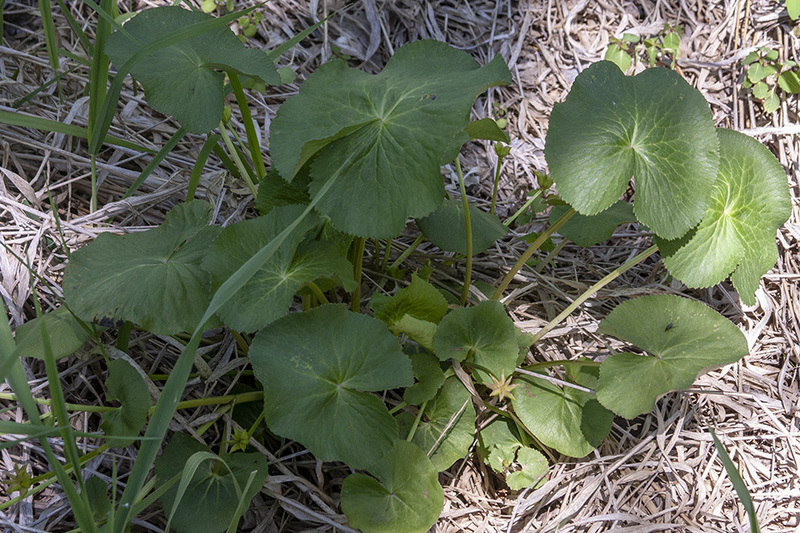 Stem leaves are alternate and similar to the basal leaves but with progressively shorter leaf stalks and wider sinuses as they ascend the stem. The inflorescence is a cluster of 1 to 7 large, showy flowers rising from the ends of the stems and from the upper leaf axils. The flowers are ⅜″ to 1¾″ wide. 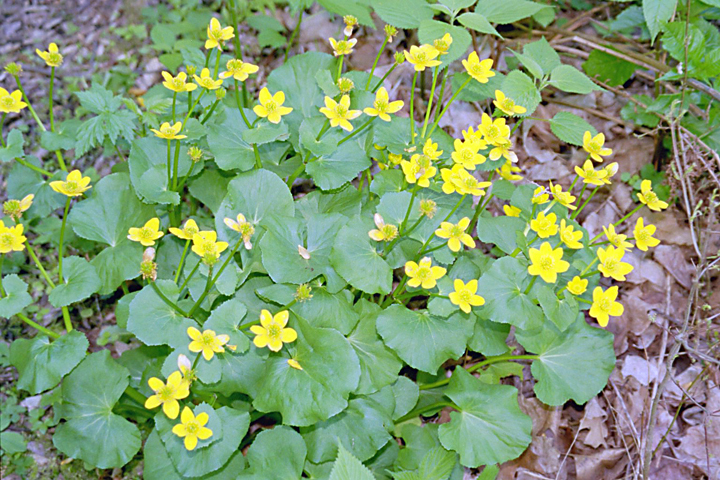 There are 5 to 9 bright yellow, petal-like, spreading, ⅜″ to 1″ long sepals. There are no petals. There are 50 to 120 stamens. The fruit is a dry, ⅓″ to ⅔″ long, ⅛″ to 3 ⁄16″ wide, flattened, curved pod containing several seeds. 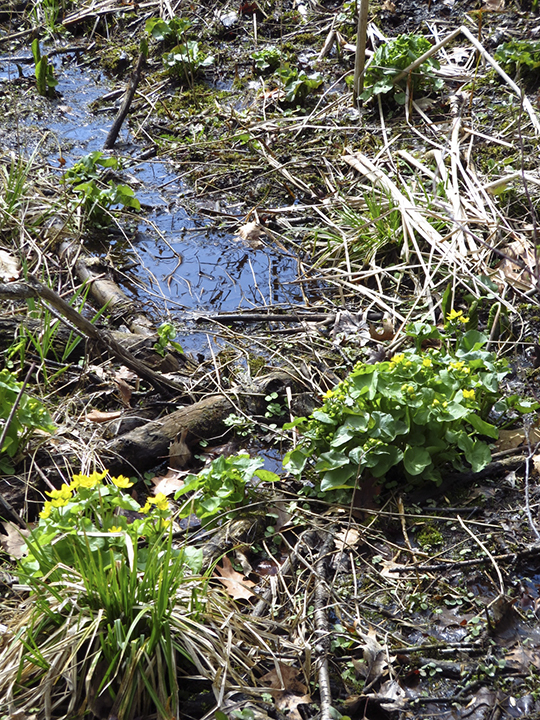 Photo taken in Crosby Farm Regional Park, Saint Paul, Ramsey County, Minnesota (by Kirk Nelson, April 2014). 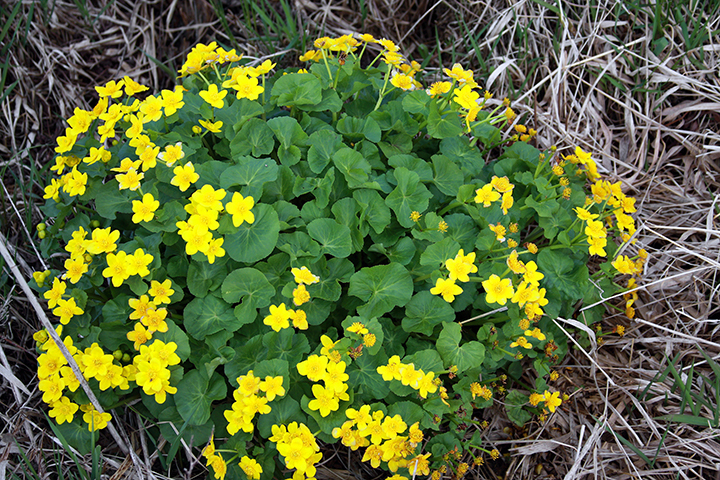 I have also seen this plant along the Douglas State Trail in Olmstead County; it appears to be quite common throughout much of the state. 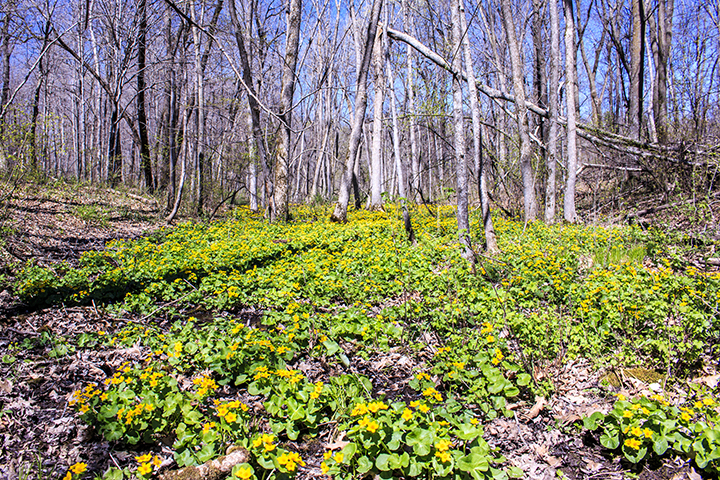 Marsh marigold blooms in early spring from March to June with bright yellow flowers. 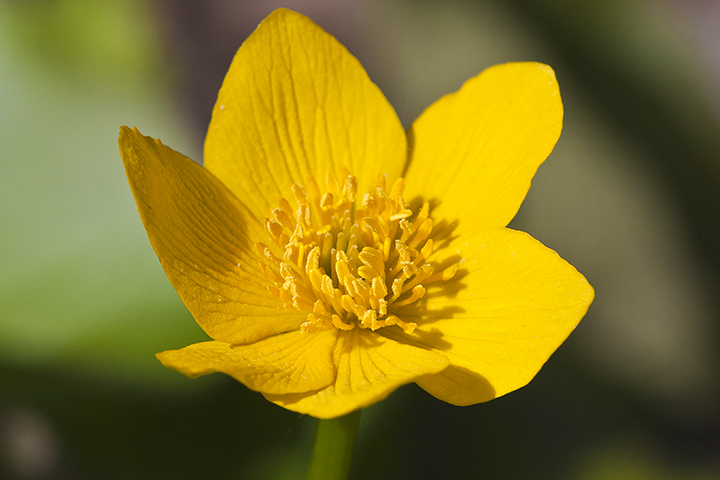 The plant is family to buttercups. 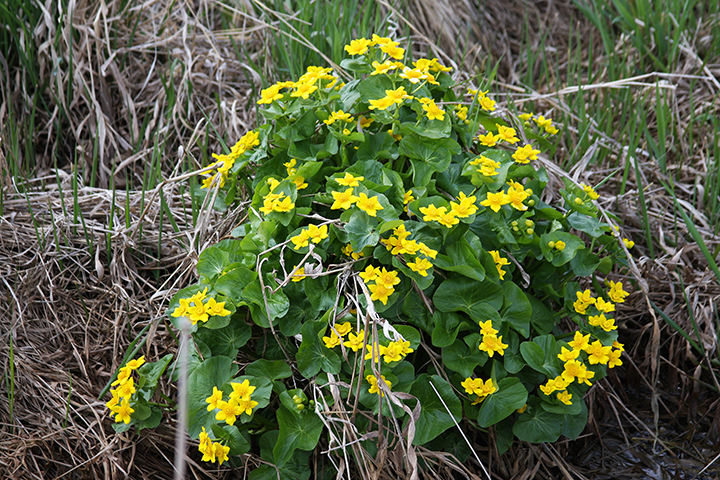 It is a plant of wet meadows, marshes and wet woodlands. 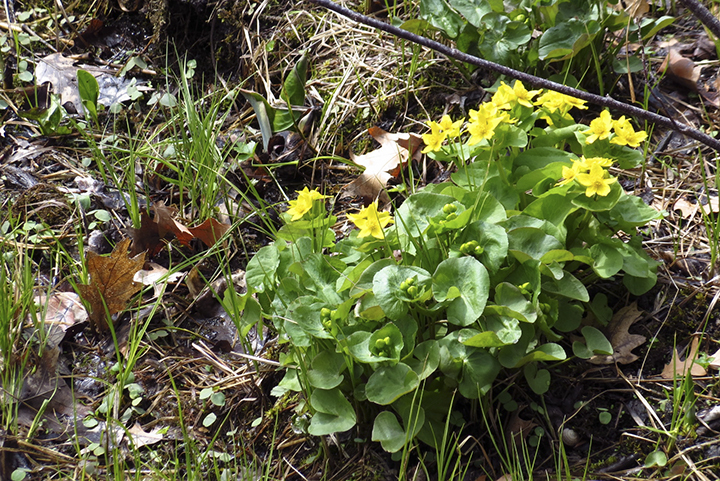 De gewone dotterbloem behoort tot de ranonkelfamilie (Ranunculaceae) en is een beschermde plant. De dotterbloem bloeit van maart t/m juni met glanzende gele bloemen langs waterkanten, moerassen, greppels en slootkanten. 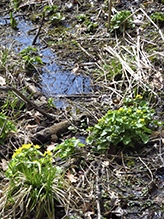 This video shows off the Marsh Marigold (Caltha Palustris). 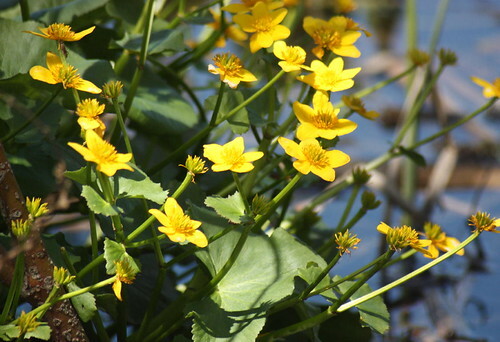 Native to streams,lakes, pond, swamps and wet woods in Minnesota. 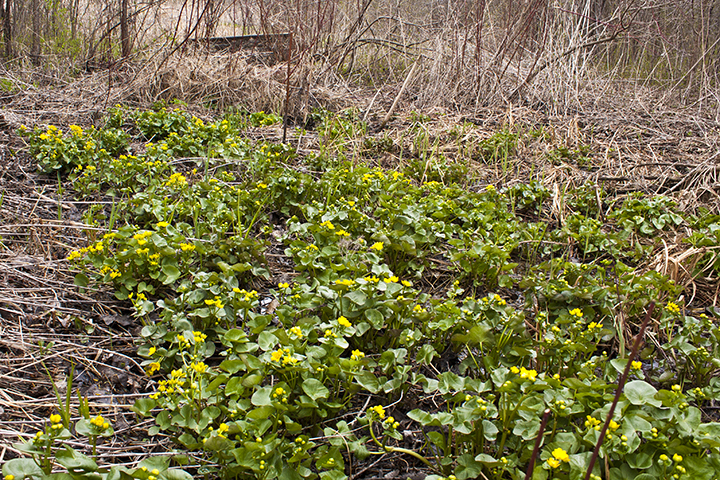 http://www.PrairieMoon.com - Marsh Marigold - Caltha palustris is one of the earliest blooming wetland native plants. 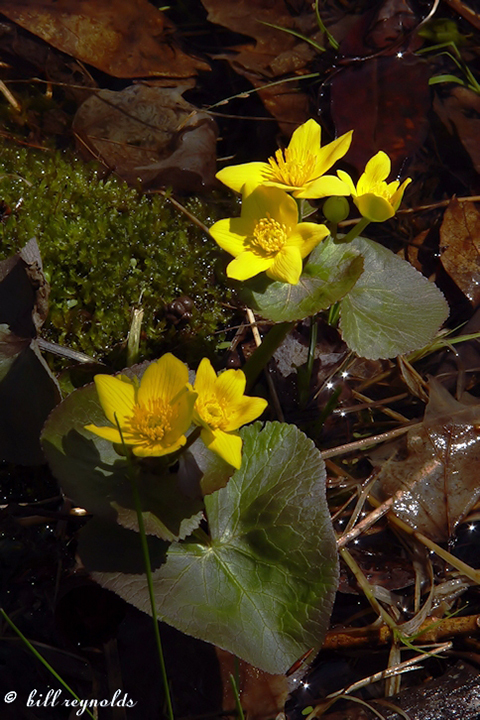 Watch as Steve, Prairie Moon Nursery Senior Ecologist, describes the natural habitat and potential uses in the landscape of Marsh Marigold on April 29th. 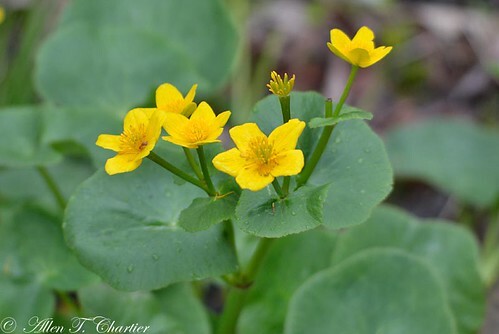 Caltha palustris (kingcup, marsh marigold) is a perennial herbaceous plant of the family Ranunculaceae, native to marshes, fens, ditches and wet woodland in temperate regions of the Northern Hemisphere. 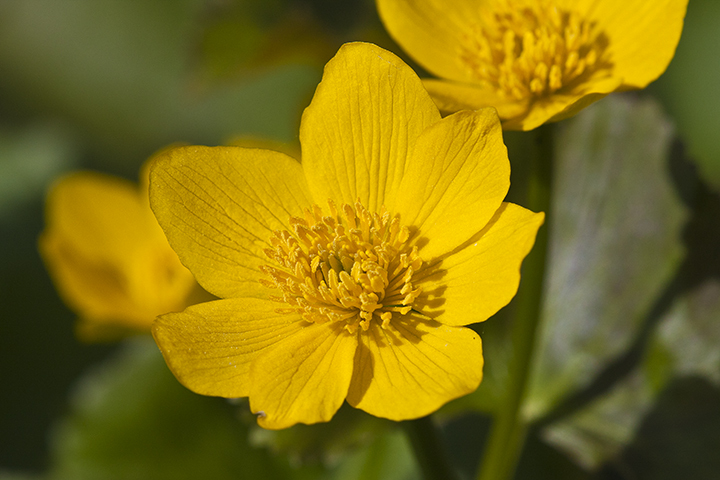 De gewone dotterbloem (Caltha palustris subsp. palustris) is een vaste plant uit de ranonkelfamilie (Ranunculaceae).